Bluxom is already big enough to start playing games - his favourite is "take the chicken wing for a walk". I have now owned my ferrets for around five days. Each time I get them out of their box for a ramble, they appear to have become more nimble, speedy and fun. When I first bought them, they were just fluffy maggots, writhing around in an insensible mess. Now that they have had their first taste of raw rabbit, they are different animals altogether. Drawing the dead rabbit and throwing the grass bag away, I placed the carcass next to a wellington boot where they were both playing. Cautious little faces emerged to tentatively sniff at the bunny, then it was game on. They lunged into the open chest, hauled out the juciest pieces of liver and spent the next ten minutes squabbling over who was to get the biggest piece. Since then, they have eaten bacon and an entire chicken drumstick, gobbling down the meat with a hilarious relish. Looking online for information on ferrets, I was initially quite confused. There is so much conflicting information out there about how they should be fed and where they should be kept, but it soon became obvious that most of that information does not apply to me. Ferrets are the third most popular domestic animal in America after cats and dogs, and an entire false science concerning how they should best be kept as “pets” has come into being. I certainly intend to look after my ferrets as well as I can, but watching them get stuck into a rabbit carcass showed that they are as wild as the heather. I may be able to train them not to bite me, but that is all I’m after insofar as social etiquette is concerned. The little hobs are going to be used to kill rabbits, not dangle from a velour hammock suspended in a plastic cage, and they are never going to be welcome indoors. Although I thought I would as I bought them, I have no regrets about the experience so far. They really are brilliant little buggers. I don’t remember any details about who made this or where it came from. All I know is that I saw it at the CLA game fair and that it cost £3,950-00. It’s extremely nice, but if whoever buys it spends that money on trees or larsen traps instead, they might have one or two real ones to look at. Friends and family on the rather ugly lekking sculpture at Coed Llandegla, North Wales. Returning from the CLA game fair on Saturday, I noticed a sign to North Wales above the motorway. Having heard that a few black grouse still survive in the Vale of Clwyd and feeling flush enough to afford the petrol, I decided to stop in and have a visit. Around half of Wales’s surviving black grouse population live in and around Coed Llandegla, a refurbished area of Forestry Commission land in the hills above Coedpoeth. Within an hour I had arrived. The woodland is managed as a mountain biker’s paradise, and it has dozens of “routes” through the forest. I have no interest at all in mountain biking, and I found the spectacle of lycra clad cyclists more than a little amusing as they huffed and howled their way around the forest. I did wonder what effect a constant human presence must be having on the usually secretive and reclusive black grouse, but I suppose that in the days when they lived in and around farms across the uplands, they must have become used to dealing with people. The forest at Coed Llandegla has been systematically felled and replanted to present black grouse with appropriate tree cover, much in the way described to me as typical of Welsh and southern Scottish black grouse habitats by Phil Warren at the GWCT. Tall spruces have been cleared and replanted with birches, and huge areas have resown themselves with young pines to varying heights of between six inches and three feet. Geometrically precise blocks have been felled and replanted, and while it’s not pretty, the heather and the blaeberry have been allowed to creep through the open areas. The forest is literally packed with food for black grouse. Managed as part of a large partnership of RSPB-like trusts and funding bodies, it seems that little attention is given to vermin control, and corbie crows roared across the tree tops as we walked along the designated paths. As I made it to the furthest point of the “black grouse route” from the carpark, the forest opened suddenly onto clear moorland, stuffed with heather and blaeberry. There, a timber hide allows paying visitors to view the lek up close in April and May, and wheelchair access throughout means that, to my taste, the forest is unpleasantly sanitised and human. Signposts and routemarkers were found every few hundred yards, and the entire area is literally swamped with cyclists screeching and yelping in neon vests. On a vaguely related note, it always amazes me how “outdoor wear” companies get away with selling lemon yellow jackets and neon orange hats. It amazes me even more that people are prepared to wear them. You can see a luminous hillwalker across three miles of open country, and they must never come across any wild animals at all. It takes a peculiar self-importance to deliberately choose clothing which makes you stand out from the countryside, and it is surely far nicer to wear a darker tone when you are out walking or cycling, if for no other reason than the fact that you wouldn’t look like litter. Anyway, it was fascinating to see a whole new approach to black grouse management at first hand, but despite the fact that the forest specialises in attracting tourists, the entire set up was scarily commercial and unnatural. 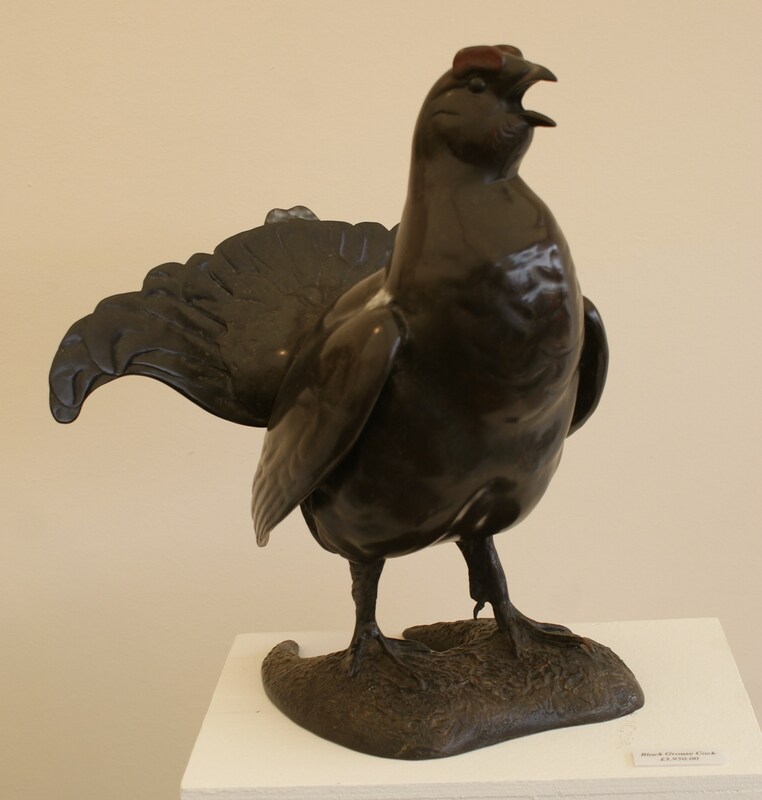 I wish the Welsh black grouse all the best, but I must say that I don’t envy them their home in Coed Llandegla. Making friends with bluxom, one of my troubled but endearing ferret kits. I have been working towards getting a pointer puppy. My entire life on the hill would be a hundred times easier if I had access to a pointer, particularly since the red grouse are so sparsely scattered across the farm that it’s now been some months since I’ve seen any of my birds at all. 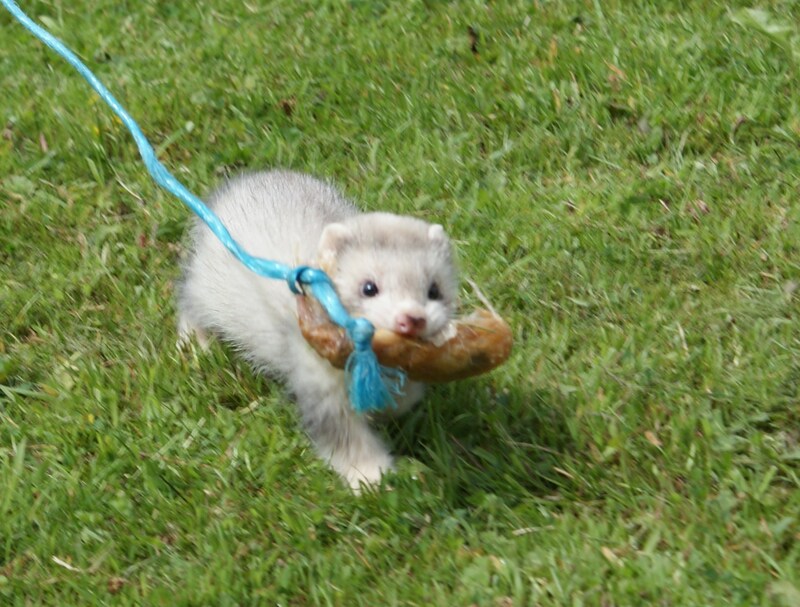 While loosely considering the prospect of pets, I noticed some ferrets advertised for sale near Arrow in Warwickshire while I was down at the CLA game fair. I have always wanted ferrets, but never really seem to have taken the plunge and got some of my own. 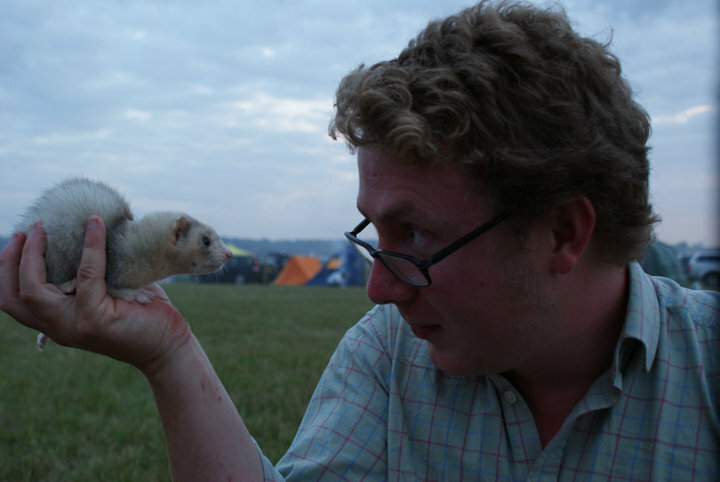 I have very fond memories of working ferrets in the past, and I know that they are relatively easy animals to keep. They occupy a middle ground between passive pets like hamsters and goldfish and more pro-active species like dogs and horses. Since I will soon turn 25 and was considering getting a pointer, I thought that ferrets might not be out of my league. However, my main problem was that I have a limited budget which necessarily needs to be spent on black grouse habitat, and keeping any pets is notoriously expensive. Ferrets would bring nothing to the project except a few dead rabbits each year, but as soon as I saw the kits, I couldn’t go back. Exploiting my ignorance, the ferret breeder was cunning and sold me two of the scrawniest little kits I have ever seen, but I can hardly hold it against him. I was out of my depth as soon as I said “hello”. I now know that one of the kits has “seal flipper” syndrome, meaning that he had calcium deficiencies in his early life and now has extremely weak front paws. The other appears to have attention deficit disorder, and neither would make it into any pedigree handbook. Ungrazed blaeberry by the woodcock strip. While I was walking around the strip, I found a greyhen’s feather. It looks quite old and tatty, but it can’t have been off the bird for more than a few weeks. The shepherd saw a single greyhen flying into the wood about three months ago, and although no one has seen anything of her since, I still have secret hopes that she is still alive and well. The more I can clean out the wood and encourage blaeberry and heather to recolonise the area, the more likely it is that she will stay around. Finally! I have succeeded in growing a 9mm high heather plant. I have created heather! Well, I didn’t exactly do it from scratch. Four months ago, I planted a packet of “Speyside Heather Seed” in a tray under my window. After a fortnight, something emerged. I watched its progress avidly, but it soon emerged that it was some weed or other. A slug ate it and I forgot all about it. My interest in the project diminished tremendously. Something else grew, but it had round leaves and was also eaten by a slug. The heather seeds were so small that I had started to doubt whether or not I had actually planted anything at all. It was only when I happened to be looking at my juniper cuttings (which are actually putting in roots!) that I noticed a tiny scrap of green on the otherwise naked black compost in the seed tray. 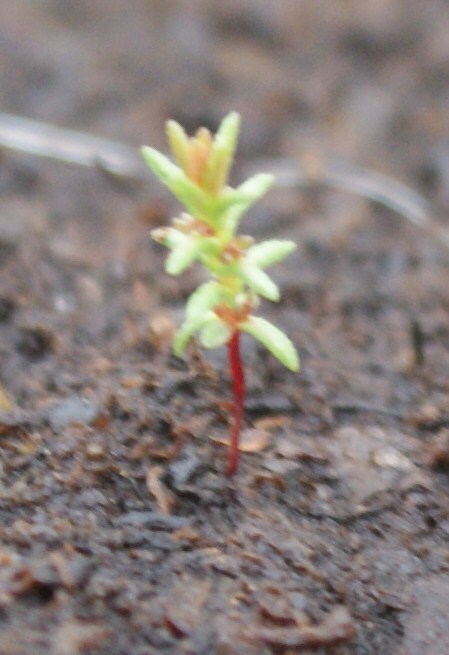 The seedling has taken all this time to grow just 9mm, but it is heather and one day it will be planted out on the Chayne. I sowed the seeds so that I would be able to learn about how heather grows. The only thing that I have learned so far is that it grows unbelievably slowly. Blaeberries growing in the woodcock strip. Seconds after this photograph was taken, all three were eaten. By me. It has now been six months since I started thinning out the woodcock strip and the effect that that work has had on the blaeberry has been really fantastic. As I brashed the trees, strained stalks emerged from the needles underneath the bottom branches. Most of the blaeberry appeared to have died away, but there were green stalks here and there. After a spring and a summer in the daylight, it has staged an amazing recovery. When I took the chainsaw up for another go at the trees yesterday, I found berries on some of the plants that I uncovered in the spring and which would have probably faded away into nothing without my help. I pushed a way into the woods and found a large patch of blaeberry which was almost choked to death by the shade of the trees overhead. Blaeberry doesn’t usually grow to be very tall, but some of these shoots were almost two and a half feet high. 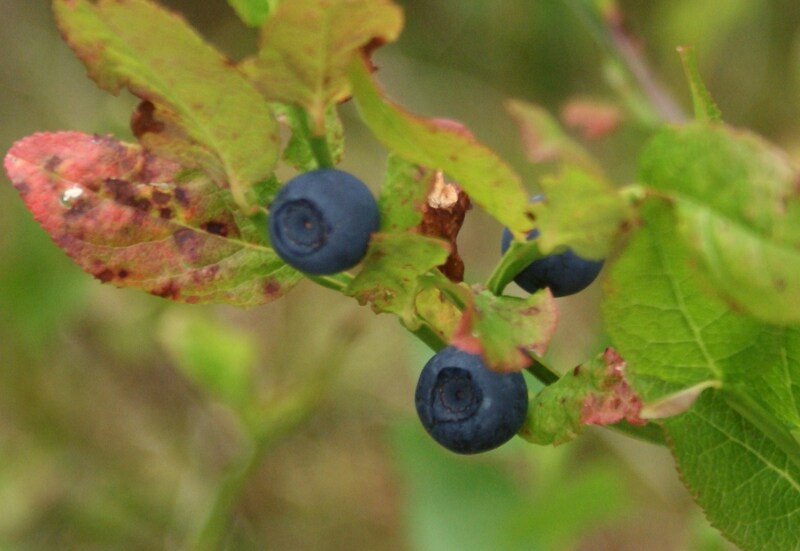 They had had so little light that they hadn’t produced berries, and many of the plants were brown and woody. I cleared three trees and brashed a path to the boundary of the wood where I found a massive pine completely smothering a nice rowan tree. Within half an hour, I had knocked the pine over (although it fell onto the fence and crushed a fencepost into sawdust – oops) and freed the rowan, leaving a nice path through thirty yards of trees, which will hopefully now fill up with healthy blaeberry plants. Clearing the trees to save blaeberry suits my purposes for two main reasons. 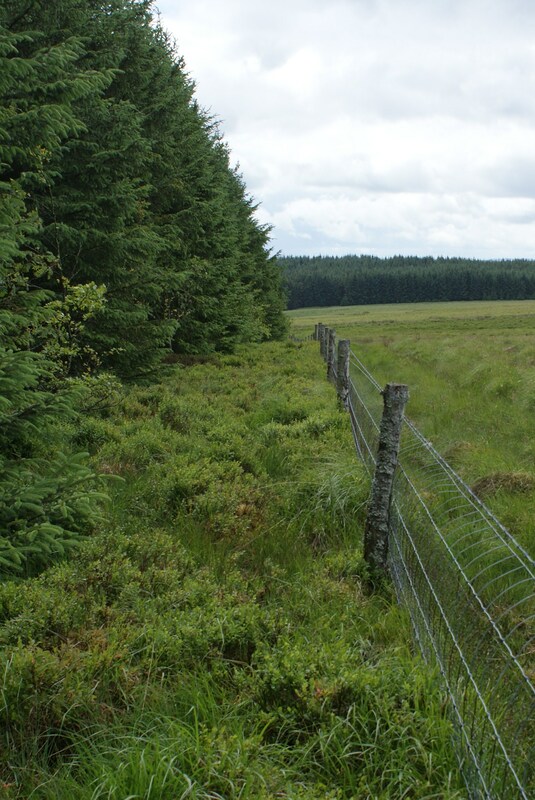 Dr. Phil Warren told me that black grouse don’t like forestry blocks, and that if I wanted birds to use the strip, I would have to thin it out by almost ninety five percent. Black grouse love blaeberry, so the more of this plant that I can make available to them, the more attractive they are going to find it. Also, woodcock like to have clear spaces in densely packed forest land so that they can move around it quickly when they are being pursued by enemies. I have piled the brash into stacks so that it doesn’t smother the blaeberry, but also to provide cover and shelter for woodcock as they rest during the day.